Research shows that when students talk together, they become better at reasoning themselves. For the sake of social equality, schools must not only teach children the spoken language skills that they need for education but equip them for a whole range of ‘talk’ and ‘think’ situations beyond the classroom. 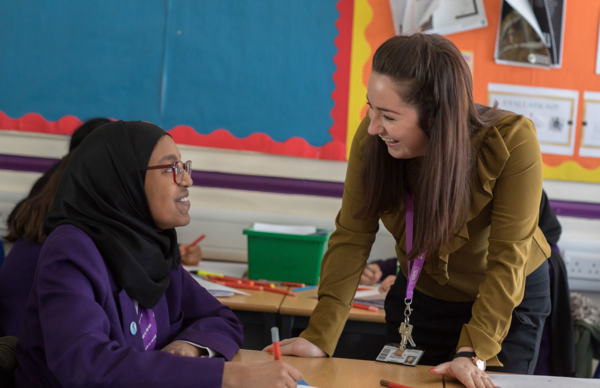 For Whalley Range, it was the Science faculty who led the way, trialing three talk protocols with students which would allow them to develop their language and communication skills in an exploratory manner. Following their lead, and with inspiration from Voice 21, we decided to roll these three talk protocols whole school. We started the autumn term with a whole school twilight, and shared our 3 chosen talk protocols with staff; ‘Talk it Out’, ‘Think and Ink’ and ‘Say it Again’. Examples of best practice were also shared with a range of innovative and creative ways in which oracy could be embedded whole school. At the end of term one, and after glowing student voice feedback, it was clear that oracy has been a regular focus in lessons. Students highlighted how oracy was useful in both helping them articulate what they were thinking and in supporting retention and memorisation. In our last strategy meeting staff shared a range of fantastic examples of how oracy was being embedded within their faculties, from practical based subjects like PE to talking through problem solving in maths. Our new focus on oracy across the whole school is gaining momentum… watch this space for updates! You’ve managed to focus a lot of valuable learning areas into one goal here, which I think is very valuable. I’d like to apply this focus to teacher development and I’d love to know more about how oracy was taught in your school.